These ETFs use futures and forward contracts to deliver twice the daily performance of the underlying for the Ultra ETFs and twice the inverse of the underlying for the Ultra Short ETFs on a daily basis. As was the case with the recent introduction of the Ultra Crude Oil (UCO) and the Ultra Short Crude Oil (SCO), these new ETFs are a bit late in being introduced. 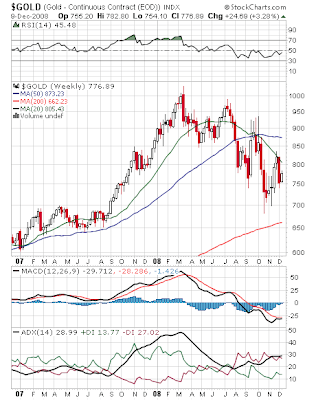 The weekly chart below shows that gold peaked way back in March of 2008. Investors would have been glad to have had that Ultra Short Gold ETF around to play that move. On the other hand, there are many commentators and bloggers who are expecting gold to rocket higher as the U.S. government prints money and issues billions in Treasury bonds to support all the bailouts and stimulus packages. At that point, the Ultra Gold ETF will come in handy. Below we see a similar picture with respect to silver. 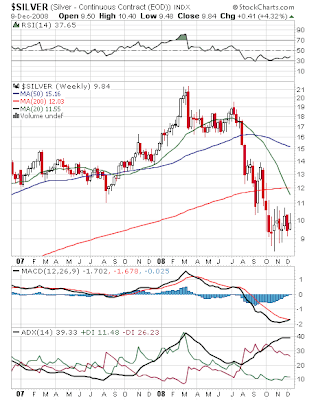 It also peaked in March and it is unfortunate the Ultra Short Silver ETF was not available at that time. It would seem that the Ultra Gold ETF (UGL) is being embraced by investors as volume seems to be growing nicely in the few days since the ETF was introduced. Given the economic backdrop, this particular ETF may indeed turn out to be a real winner.